During the course of driving, the throttle cable may gain some slack and will be in need of adjustment. This is particularly important for those vehicles equipped with automatic transmission since this may affect the shift points of the transmission. 1. This adjustment is made easier if the engine is cold and the car has not been driven. If the engine is hot, be careful around the intake manifold and throttle bodies since they'll be hot to the touch. 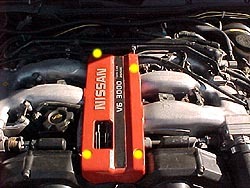 To access the throttle linkage cable, remove the four hex bolts that are holding the throttle cable cover to the manifold (4 x 5 mm hex head) (yellow dots in 1.). 2. 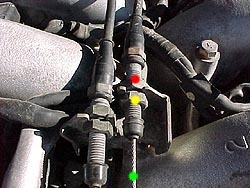 The cable on the driver side is the throttle cable linkage (green dot in 2.). The one next to it, on the passenger side, is for the cruise control. To make the adjustment, loosen the front nut (1 x 14 mm) (yellow dot in 2.) - counterclockwise, looking from the front. Next, loosen the rear nut (1 x 14 mm) (red dot in 2.) - clockwise, looking from the front. To tighten the cable linkage, pull on it, going towards the balance tube. To loosen it, pull it towards the front of the car. It will probably need to be tightened; once there is little slack in the linkage, tighten both bolts, re-install the throttle cable cover and the bolts.